Our goal is to contribute to a safe and prosperous society by realizing advanced cognitive functions such as eyes and ears for computers, and to establish the computational and security theories that are needed along the way. The following three research groups are engaged in fundamental, theoretical, and practical research. For video, audio, and images, we are developing a technique for searching and identifying media content at high speed that is unaffected by signal distortion or noise. With this robust media search (RMS) technique, we can support the storage and distribution of information and thus better handle the media information explosion. 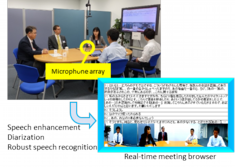 Meeting recognition systemWith the world’s most advanced speech enhancement and speech recognition technologies at its core, we are implementing technology that uses audio information to help us understand the surrounding environment as a communication scene. With this technology, we hope to develop new services that help people to communicate in more natural ways. 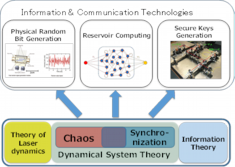 By making active use of physical phenomena such as laser chaos, we are implementing a high-speed random number generator, an information-theoretic secure encryption system, and a fast spatio-temporal signal processing system. With these technologies, we will contribute to the implementation of safe and secure communications and very fast information processing. By applying the principles of quantum mechanics, it will become possible to perform diverse types of information processing that are currently regarded as impossible. 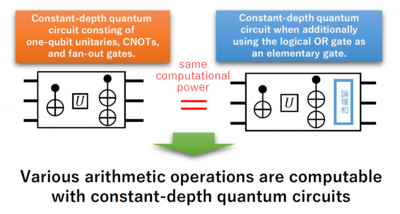 Through our research into quantum information science centered on quantum computing and quantum cryptography, we aim to implement quantum telecommunication techniques in the near future. We are exploring the possibilities of formal methods, which are techniques for providing rigorous mathematical assurances of the security of systems. We aim to provide a high level of safety and security in telecommunication systems that provide essential services such as e-commerce, e-government and e-health.